Auguste Comte by Tony Touillon. 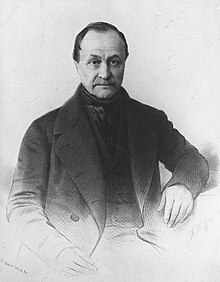 Auguste Comte (full name: Isidore Marie Auguste François Xavier Comte; January 17, 1798 – September 5, 1857) was a French thinker who was one from founders of sociology (from the Latin: socius, "companion"; and the suffix -ology, "the study of", from Greek λόγος, lógos, "knowledge" ) and positivism. It was recently discovered that the term 'sociology' had already been introduced in 1780, but with a different meaning, by the French essayist Emmanuel Joseph Sieyès (1748-1836). Comte was born at Montpellier, in southern France. After attending the University of Montpellier, one of the oldest European universities, Comte was admitted to the École Polytechnique in Paris. He married Caroline Massin, but divorced in 1842. He died in Paris on September 5th, 1857 and is buried at the famous Cimetière du Père Lachaise. His apartment from 1841-1857 is now conserved as the Maison d'Auguste Comte. The law of three stages is a socio-historical idea of Auguste Comte. Comte said that knowledge developed in three stages. The first stage is the "theological" stage, in which Comte says that people use religion or gods to explain why things happen or where things came from. The second stage is the "metaphysical" or "abstract" stage, where people use philosophy and abstract ideas to think about their beliefs and explain things. The last stage is the "positive", regarding to the three stages of positivism. Comte said that society could shift into a positivist society if the sciences, including sociology, are all used to explain things. ↑ Des Manuscrits de Sieyès. 1773-1799, Volumes I and II, published by Christine Fauré, Jacques Guilhaumou, Jacques Vallier et Françoise Weil, Paris, Champion, 1999 and 2007. See also Jacques Guilhaumou, Sieyès et le non-dit de la sociologie : du mot à la chose, in Revue d’histoire des sciences humaines, Numéro 15, novembre 2006 : Naissances de la science sociale. This page was last changed on 12 August 2018, at 15:33.